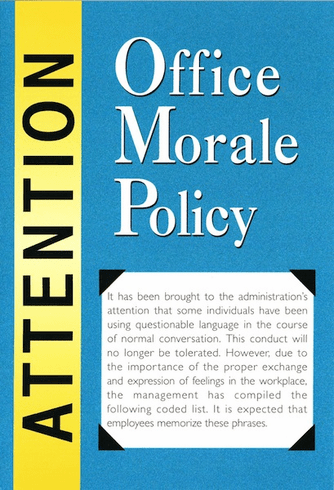 Outside: Attention- Office Morale Policy: It has been brought to the ministration's attention that some individuals have been using questionable language in the course of normal conversation. This conduct will no longer be tolerated. However due to the importance of the proper exchange and expression of feelings in the workplace, the management has complied the following coded list. It is expected that employees memorize these phrases. Inside: List of old and new phrases.